Environment Minister Phil Hogan has refused to meet with the residents of the doomed development saying that he “cannot interfere in individual cases”. RESIDENTS OF PRIORY Hall have demanded a meeting with the Minister for the Environment. The residents, who were forced out of their homes in October over a fire safety breach in the development, say that they face an “uncertain future”. Environment Minister Phil Hogan last month refused to meet with the residents, saying that he “cannot interfere in individual cases”. Residents are concerned about who will provide their accommodation if Dublin City Council wins a Supreme Court appeal this week which would absolve the council from paying for the costs. “We face an uncertain future in terms of immediate accommodation needs, the future prospects for Priory Hall itself and whether we will be able to meet our mortgage obligations,” the residents said in a statement. The residents have asked the three TDs and four Dublin city councillors who represent the Donaghmede area to co-sign a letter to Phil Hogan from the residents asking for a meeting. The letter is due to be handed in during a residents’ protest outside Leinster House this afternoon. 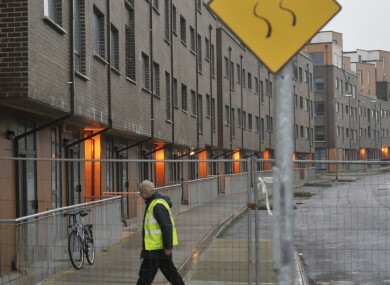 The residents of the Donaghmede development were forced to leave their homes in October when Dublin City Council ruled that it breached fire safety legislation. There is now a major dispute over who should pay for housing the residents, with Dublin City Council claiming that it doesn’t have the money to pay for alternative accommodation. The Supreme Court will hear the appeal from the Council tomorrow over an order which gave the Council responsibility for covering the accommodation costs. Residents have said that they have had no direct communication from the Council over what will happen if the Council wins its appeal and no longer has to pay for emergency accommodation for the residents. The developer of the complex, Thomas McFeely, was sentenced in November to jail for three months and a fine of €1 million for contempt of court orders relating to his development. The judge in the case later granted McFeely a reprieve against the sentence. Email “Priory Hall residents demand meeting with Minister for Environment”. Feedback on “Priory Hall residents demand meeting with Minister for Environment”.